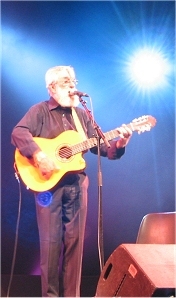 Joseph Ronald "Ronnie" Drew (irlandès: Ránall Ó Draoi; Dún Laoghaire, 16 de setembre de 1934 - Dublín, 16 d'agost de 2008) va ser un cantant, músic i actor irlandès, conegut internacionalment per la seva participació al grup The Dubliners. És reconegut principalment per la seva veu en les cançons "Seven Drunken Nights" i "The Irish Rover", peces que van arribar al top 0 de les llistes del Regne Unit. El seu aspecte també era fàcilment reconeixible, principalment per la seva llarga barba i la seva veu greu, que en una ocasió va ser descrita per Nathan Joseph com "el mateix so que fa el coc quan es destrossa contra una porta" ("like the sound of coke being crushed under a door"). "Nelson's Farewell" · "The Black Velvet Band" · "All For Me Grog" · "Seven Drunken Nights" · "Never Wed An Old Man" · "Dirty Old Town" · "Hand Me Down My Bible" · "Free the People" · "Raglan Road" · "Don't Get Married" · "The Irish Rover" · "Jack's Heroes" · "The Rose" · "Red Roses for Me" · "The Ballad of Ronnie Drew" · "The Rocky Road to Poland" · "The Auld Triangle"
"The Wild Rover" · "Whiskey In The Jar" · "Four Green Fields"
↑ «The Medusa Fora • View topic – Dubliners + Ronnie Drew». Pogues.com. [Consulta: 22 octubre 2013]. ↑ «Dubliners musician Ronnie Drew dies». BreakingNews.ie, 16-08-2008. [Consulta: 22 octubre 2013]. ↑ Doyle, J., Bobby Lynch – The Forgotten Dubliner, ThreeMonkeysOnline.com, November 2008. Retrieved on 19 January 2010. ↑ WMC News Department, Ronnie Drew, Founder of The Dubliners Dies at 73 Arxivat 15 August 2010[Date mismatch] at the Wayback Machine., 18 August 2008; retrieved 19 January 2010. ↑ More L., Freeborn Men of the Common People, AllCelticMusic.com, March 2002. La pàgina va ser modificada per darrera vegada el 9 maig 2018 a les 19:02.